I cannot believe I am about to begin a journey that has been a dream for much of my adult life and in the planning for over 2 years! I struggled with the jetlag of my journey here. Although my body is still a little tired, I am ready for the challenge ahead. Adjusting my sleep pattern hasn't been helped by my mind reeling from the 'what if?' scenarios that have kept me awake in the early hours. But, after a good food and rest last night I am more or less back to normal this morning. This has been helped in no small part by my wonderful host family, David and Lynn and their son Will, who have gone well above and beyond the call of duty to welcome a humble cyclist into their own home. I will be eternally grateful for their assistance in getting me started on what will no doubt be a fantastic adventure and the solid foundation they have given has set me up in good stead. Thank you for your tremendous hospitality. This is without doubt, little miracle no.1 on my journey. Anchorage is my first experience of the United States and the American continent and people. Being the capital of Alaska it is a sizeable city with all the resources you might expect. But the huge mountains on the east side remind you that the wilderness is never far away. As I had several chores to do, I was given directions by Lynn to the local stores. A mile or so walk along a popular urban trail.
" Oh, by the way, if you are using headphones as you walk, be careful of the Moose. They can attack and kill if surprised!" I was told, before I left. But I thought I was well inside the city limits here?! It was a reality check if there ever was one. And a reminder that these animals roam free and are best avoided. I will certainly be doing that. I didn't see any as it happens, but I was certainly checking behind every tree and bush! Imagine the famous Abbey road Beatles photo but with a large, horned, angry vegetarian crossing instead! The reality is I am stepping into a VERY large cage full of VERY large and dangerous animals. While this is a huge concern, the cold concerns me more. The temperature at landing in Prudhoe bay at this time (25/05/2014) is around -6C (23F) but forecasting above zero by the time I will arrive. As I head inland I hope it will get warmer and the Atigun pass will be open. Right now, I am repacking my bags and bike for the plane journey tomorrow morning and then I begin. I will be out of communication for approximately 10 days so check back later. I hope I have enough food and that the bears and other animals are not too interested in cycling or cyclists! It is a VERY tough road and you need to be both physically and mentally prepared for it. I was and though it didnt get me, it did get my bike. I am in Fairbanks, AK writing this as I try to work out how to fix the damaged bearings in my front wheel. There is an excessive amount of play which from experience is not a good sign. Although I built my bike myself, there are 3 things I have no control over. The front and rear hubs and the rear shock absorber. All VERY reliable parts and bought because of their durability, but this proves anything can fail. And has done. It is Sunday and I cannot contact the manufacturer, although my email is sitting waiting for someone to reply tomorrow. I hope they can come up with a sensible solution. I could find a local bikes shop and buy a cheap new hub, but I then need to find spokes and rebuild the wheel. I'll wait 24 hours for the manufacturer first. The flight to Prudhoe bay was very fast. The plane landed in the morning and I spent an hour in the arrivals lounge building up my bike and chatting to the friendly airport staff. I booked to go on the official tour, but as these only run twice a day, so I had to wait for the afternoon run. I made my way to the famous(and expensive!) general store and took a few photos. There I had reserved a week before, some liquid fuel canisters and bear spray. Neither of which are permitted on the Aeroplane. Unfortunately, the person ordered the wrong type of fuel and I had to change to butane gas, which in summer time would not be a problem, but in cold condtions, is known not to be reliable. I had no choice, I bought two. I then cycled the short distance to the Deadhorse camp. Who organise the tours and waited there. The chef invited me to eat at the $15 all you can eat buffet and I had a couple of big plates full of food. And another box to take with me. The tour started early as I was the only one on it, so Brandon, the security guard and guide showed me round the vast complex and gave a lot of information about the operations and its interactions with wildlife. I stood at the northern most point of planet Earth I am ever likely to stand on and made a snow angel on the Beaufort sea. On top of several feet of snow and 8 feet of frozen ocean then got slightly emotional as I realised that stepping back onto the land was the first step in what promises to be an epic adventure. And the first step on my journey south. Then finally, after the tour was over, the journey was about to begin. Brandon assured me that I need not worry about the Polar bears as they rarely go inland, but the grizzlies and blacks may be a problem further down the road! Great! Calm my fears why don't you?! As I started the day at 4 am, I didn't plan on cycling far. I pedalled for around 30 miles before camping on a roadside path. Here I had my first casualty. The kickstand on my bike snapped. I think it was damaged in transit and the extra weight and cold finshed it off. Now I have to manually handle the bike or lie it down till I can get a replacement. It got cold fast. Even though the sun doesnt set, it is low in the sky in the evening and the proximity to the north coast means cold winds, blizzards and storms move in quickly and fiercely. As I set up my tent the first blizzard set in. It was short but harsh. I ate my cold takeaway and climbed into my sleeping bag. Here I made my first mistakes. I didn't reheat the food, for fear of the smell attracting the animals. It cooled me down inside. And I climbed into bed wearing wet clothes. Sweaty from cycling. That night was cold. My now very damp sleeping bag, not good at insulating me and I suffered for it. The second blizzard came sometime after I fell asleep and splattered little crystals of ice against the outside of my tent. My first night in the Arctic tundra, wet, cold in bright sunshine and continually listening for bears, wolves and other nasties wanting to eat me was not the best start. But I survived. I woke VERY early at 4 am the next morning the sun overhead and I was cold and thought I should move to warm up. I didn't prepare any breakfast, but packed up and just cycled. Hoping I might find somewhere to shelter and eat. The north slope is flat frozen tundra. Little lakes frozen, Marshes frozen. No trees, bushes, banks or anything else to shelter from the freezing wind. There were signs of melting, A lot of water birds migrating north and settling in the marshes seemed to brush off the weather and be happy until I came and disturbed them. But I kept going on the potholed gravel road. Later I ate more of my very cold takeaway and realised that the plastic bag and box had cracked in the cold and food leaked over my things. So the smell was now drifting in the wind and beckoning in the hungry animals for a feast! The second day I mananged about 45 miles on barely any food. Not clever. So I resigned myself to just eat. I filtered water from a snowmelt stream and prepared myself a meal from the bag of food I carried. After that I felt a little better. The camp site that evening was another roadside path. And I stashed my food away from the tent on top of a gatepost a short distance away. Probably not far enough, but the other choice was next to the well chewed bones of some large unfortunate animal that never made it through the winter. It had rained during the night and the Dalton at this point was very narrow. The trucks were driving by in brown clouds of very liquid mud, and I just knew that in just a minutes I would be coated in it. But within 100 metres of joining the road again, the tarmac started, and continued for about the next 10 miles. The road began to roll through some low, but steep hills, eventually dropping down alongside the Sagavanirtuk river. I stopped to filter and fill by water bottles again. As I set off I was almost immediately flagged down by an oncoming pickup truck. Aart Nugteren was part of the research team from the Toolik lake research station. He was out studying and analysing the wildlife and we had a good conversation for a few minutes. Later he came by again and offered a lift a few miles down the road. Although this journey will be mainly by bike, part of the adventure is about meeting people and if that involves a short car journey, so be it. We had another good discussion about his history and research in the Arctic, as well as the road ahead and parted company a few miles down the road. I carried on through the first construction site and was soon covered in thick dust. The following day, I headed to the notorious Atigun pass. Quite nervous as I had heard tales of Avalanches, destroyed trucks, extreme weather and generally not a nice place to get into trouble this time of year. As I go closer, I heard another vehicle behind me and Aart appeared again. He offered me another lift over the pass and honestly I am glad I accepted. The tales I heard were right. With the headwind and bad weather, it would have taken me 2 days to cross the pass. There was a huge fresh avalanche on the roadside, thick fog for hundreds of metres. Crazy truck drivers approaching and ice storms blowing wildly on top. Not a good place for a lonely cyclist to be, but certainly rideable in the warmer weather. I feel no sense of defeat by not riding this as I must always put safety first. I am still over 300 miles from any help so any accident could be very serious. The southern side of the pass is dramatically different to the north. Vast forests of Spruce trees suddenly appeared blanketing the land in green. The road started smooth but muddy then for the final 30 or so miles to Coldfoot, became good smooth tarmac. I also had a tailwind, sunshine, beautiful scenery, silence and small hills. If only all roads could be this idyllic. Coldfoot is about as close to civilisation as you are likely to get along the highway. Stop here and enjoy a real meal, a shower and if you can stand the noise, camp for free on the lawn next to the inn. It is a truck stop mainly, but there is an airport if you chicken out, an interesting visitor centre, bed breakfast, fuel and the famously vague post office DOES DEFINITELY EXIST. Start the next morning with a good breakfast too. I continued south along the road and it immediately became hilly and steep. The tarmac ended then appeared patches of loose gravel and potholes. As I decended the hills my steering became twitchy and something didnt feel right. I continued and blamed the loose road conditions. Later I noticed I was climbing and drifting across the road. I put it down to tiredness, not concentrating and steep hills. At one point the road was too long and steep to cycle. I got off and pushed up. As I walked, the bike began veering off course. It is normally quite stable. I checked the front wheel and discovered play in the front wheel. At first I thought the quick release was loose. No. Brakes? Forks? Nothing. Then realising my usually bombproof SON dynamo hub had play in the bearings. 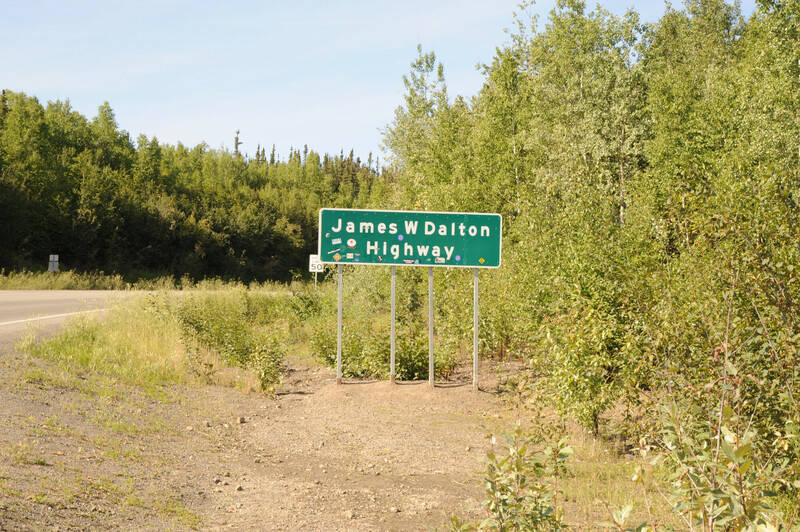 I am assuming the 8.5 year old seals had finally given up and allowed the super gritty Dalton highway dust and corrosive chemicals in to do their damage. Having worked on bikes for several years, I know what the next stage is. These bearings could last another 5 miles or 500 miles but they will collapse catastrophically. 250 miles in from my epic ride, I was not going to take a chance. So I resolved to ride to the Arctic circle and stop there hoping that a passing tourist might help me limp back to Fairbanks. Bob and Cathy Andersen, from Saskatoon, Canada were on a long trip through the northern territories and Alaska. They happened to be having a picnic lunch break when I came and interrupted them. They not only shared the remainder of their food with me but piled me into the back of their car and drove me to the door of the hostel in Fairbanks! I spent one night in Billie's Backpackers hostel. A funny but pleasant place though expensive even for a budget traveller. I had previously arranged to stay with more warmshowers hosts, but was arriving a week early. So a frantic search began to find somewhere cheaper for the following few nights. Right now, I am on the southwest side of Fairbanks staying with the very generous Edwards family while my front wheel flies ahead to the USA distributor for an expensive repair. I hope it will be back soon. But for the next few days I have not much to do. I will plan the route ahead, wash my clothes, restock my food and explore Fairbanks. All while trying to avoid the urban Moose, Bears and Lynx which I'm told are a common site here! My arrival was also greeted with a very strong south easterly headwind.